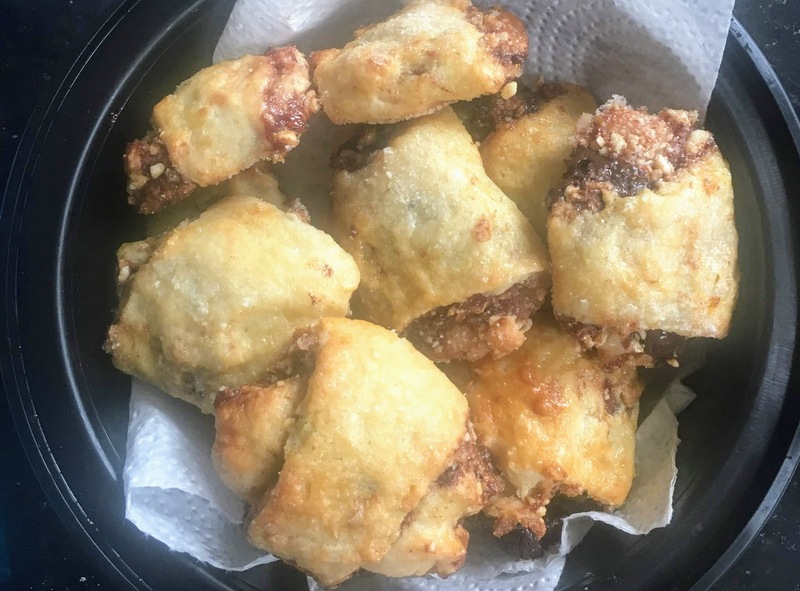 Rugelach, an Eastern European Jewish pastry, means “little twists” in Yiddish. With their crescent shape and flaky, buttery crust, these bite-size treats are cousins of the French croissant. They are typically filled with fruit preserves, cinnamon, nuts and/ or chocolate. 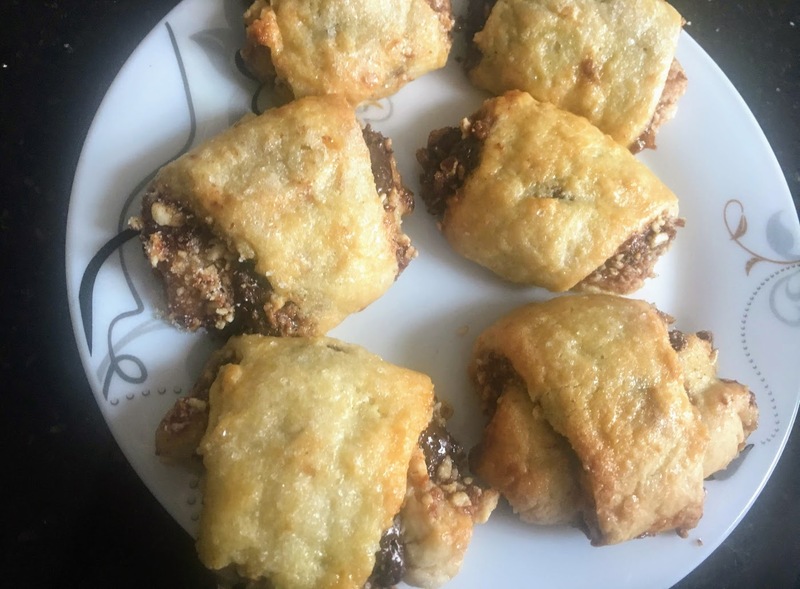 When I set out to make rugelach at home (having long eaten rugelach at bakeries, I was pleasantly surprised how simple they were to prepare,) I filled them with one of my favorite flavor combinations: raspberry jam, dark chocolate, and almonds. I lightly adapted a dough recipe from the New York Times, adding almond extract to enhance the flavor of the almonds in the filling. I love that the dough has no sugar; the only sweetness comes from the raspberry jam and a little sugar sprinkled over the filling and the surface of the cookies before they bake. Note: For the filling, I bought a high-quality dark chocolate bar with 70 % cacao content and cut it into small chunks. This lends a slight bitterness to the rugelach, complementing the sweetness of the raspberry jam. If you prefer, feel free to try substituting semisweet chocolate chips. Prepare the dough: Remove butter and cream cheese from the fridge, and set aside for around 10 minutes, until slightly soft but still cold. Divide cream cheese into 4 pieces, and butter into 8 pieces, so they are easier to mix with the other ingredients. In the bowl of a small food processor, combine flour and salt. Add slightly softened pieces of cream cheese and butter. Process until a smooth dough just begins to form. Remove dough from food processor bowl, and shape into a rectangle. Wrap in plastic and refrigerate for at least 2 hours. Assemble and bake: Place a rack in the center of the oven. Preheat oven to 350 degrees and line a baking sheet with parchment paper. Remove dough from the fridge, and let soften for around 10 minutes. On a floured surface, roll into a large (roughly 5 x 13 inch) rectangle, adding flour as needed to prevent dough from sticking. Spread with raspberry jam. Sprinkle evenly with cinnamon, and then sugar. Evenly distribute ground almonds and dark chocolate chunks. Cut the rectangle in half, forming two rectangles. Cut each rectangle into triangles. Roll up each triangle, starting at the base, into a crescent-shaped cookie. Place cookies at least an inch apart on prepared baking sheet. In a small bowl, whisk together egg and water. With a pastry brush or the back of a spoon, spread glaze over the surface of each cookie. Sprinkle the rugelach liberally with granulated sugar. Bake for 20-25 minutes, until the tops just begin to turn golden brown (the bottoms of the cookies should be a deeper golden brown.) Let cool, and then serve. Place leftover rugelach in an airtight container and store at room temperature. looks nice, neat and tasty ! !